Setting a series of games in the same world is a great marketing tool for games publishers. If done well, it allows them to present a consistently branded series and encourages gamers to at least take a look all the games in the series, when normally they might not notice three separate games with little or nothing in common. A more cynical view would be that this marketing strategy is at best a way to re-use artwork across multiple games, and at worst, trick consumers into buying games they might not normally be interested in. I'm happy to say that this was not the case with Explorers of the North Sea, part of designer Shem Phillips' North Sea trilogy of games. Obviously the look of the game is very similar to Raiders of the North Sea, but that's not a problem at all - both games feature superb graphic design and illustration. The games are thematically linked, but feature different stages in the life-cycle of the viking culture. Where Raiders is about preparing and executing raids on settlements, Explorers covers setting off into the unknown, establishing outposts, and bringing back livestock, with raiding being a relatively small part of the game and only one of may paths to victory. 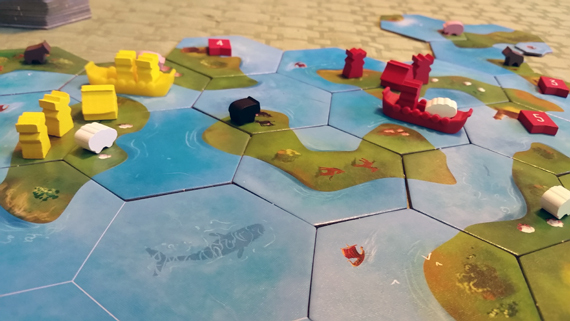 The game board is composed of tiles that are placed one by one over the course of the game, forming waterways and islands of various sizes. Each tile features elements in support of one of the game's various ways to earn points: livestock to be brought back to the starting tile, non-player ships to be attacked, settlements to raid, and empty space to build outposts on. Placing tiles involves a fair amount of strategy all on its own: you can create small islands that are easy to control and navigate around, or large ones with space for multiple outposts that earn a lot of points at the end of the game. Direct player interaction is fairly minimal, which might frustrate players who like a lot of interaction but is great for those who prefer less confrontational games. Each player starts the game with a leader character with a unique way to get extra points, which helps guide your strategy and makes the game a race to see who can best take advantage of their leader's ability by the time the game ends. Explorers isn't quite as interesting as Raiders, but it's still pretty fun and quite a bit simpler. That, combined with its less competitive nature makes it a great game for new gamers, while still having enough going on to keep more experienced players interested. Rating: 4 (out of 5) A great addition to the North Sea series and a good gateway game to get new people interested in board games.